Mini Fighters is a gaming app in which you pick fighters with unique skills to duke it out in a street brawl. The app was created by PG Soul Game Studio for an iPhone and iPod Touch, and costs $0.99. There are three different modes to choose from when you start out including Tournament, Single Player, and Player Versus. In Tournament, you choose a player to pit against the computer’s player from a group of 6. There are 12 total, but access to 6 of them has been restricted until you unlock them. The players are completely odd looking with 2 soccer players, a baker, 2 half man, half cat hybrids, and a player that looks like a mixture of robin hood and peter pan. The player’s stats are shown in the top left corner of the screen through unclear and bizarre icons. Once you have made your choice and you are ready for battle, you are put in an arena with your opponent. At the top two corners of the screen are the pictures of the two players, yours on the left and your adversary on the right. Each of them gets a bar indicating how much juice the player has left in him and in the middle is a weathervane icon. Whenever a shot is fired, the psyche of the player is shown through a bubble that pops up with an octopus inside of it that either laughs or cringes in pain. To shoot, you have to hold your finger down on a launching button and then release and only one player can shoot at a time. 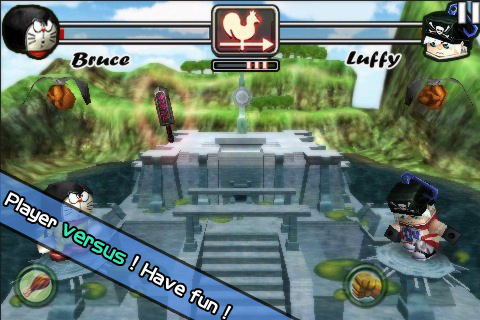 If you choose the Player Versus mode, you get to pick two players to fight each other. Once you choose, before you start playing, you have to select a penalty for the loser from a list of punishments like, “The loser gonna pay the bill!” and “If you lose, must laugh one minute”. 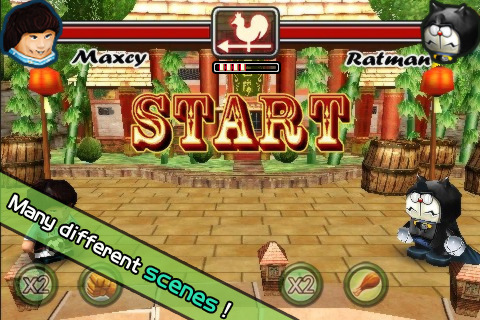 Mini Fighters is kind of cute and I really want to like it, but it was boring. The delay in shooting capabilities and overall weirdness make for a slow-paced and puzzling experience. AppSafari review of Mini Fighters was written by Vanessa Paszterko on January 26th, 2011 and categorized under Action, App Store, Beat-em Up, Fighter, Games. Page viewed 3208 times, 1 so far today. Need help on using these apps? Please read the Help Page.